Al Jarreau (USA); Andrea Motis and Joan Chamarro (SPAIN); Cannibal Ox (USA); Dee Dee Bridgewater and Irvin Mayfield with The New Orleans Jazz Orchestra (USA); Donald (SA); Gavin Minter Septet (SA); Heathfield High School Jazz Band (SA); Hugh Masekela and Oliver Mtukudzi (SA/ZIM); Jason Miles presents: To Grover With Love, ft Gerald Veasley with Marion Meadows and Elan Trotman (USA); Jitsenic (SA); Mike Del Ferro ft Tony Lakatos (NETHERLANDS/SA); Mike Perry’s Tribute To Winston Mankunku (SA); Mr Cheeks (USA); Naima McLean (SA); Prophets Of Da City (SA); Ringo Madlingozi (SA); Pacific Express (SA); The City (SA) featuring Paul Bothner Music endorsee Ruby Crowie; Thundercat (USA); Victor Masondo and Friends; A Journey Through Music Celebrating our Rich Heritage and Legacy, ft Thembi Mtshali (SA); Yvonne Chaka Chaka (SA). 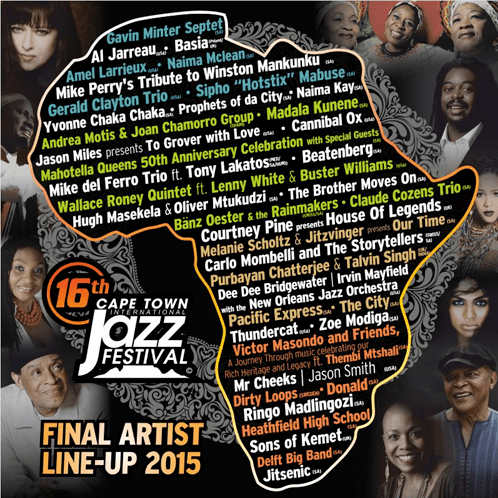 Each year, the CTIJF grows in strength and popularity. This is underlined by the record sell-out of its initial weekend passes released in November last year, and the fact that there are very limited day passes, private hospitality and individual hospitality packages available. Enjoying the excitement and the unique learning experience of being exposed to a world-class event will be some 200, Grade 11 and 12 students. They will once again participate in the respected training and development workshops and programmes that are the lifeblood of the festival, as much as the artists who perform here. Commenting on the growth of Africa’s largest multi-stage music festival and its contribution to the progression of the entertainment economy, Minister of Arts & Culture, Nkosinathi Mthethwa said: “We have been associated with the Cape Town International Jazz Festival since its inception and once again, we are proud to be the leading sponsor and supporter of what has come to be known as ‘Africa’s Grandest Gathering’. Rosies stage tickets cost R30 per performance and will be available from mid-Feb 2015, they are not included in the day pass price. Please visit www.capetownjazzfest for the updates.